Many people are familiar with the Camino de Santiago (The Way of Saint James), the pilgrim route through southern France and northern Spain that has become as popular with walkers, cyclists and travellers as it is with pilgrims from around the world. Today only this route, the French Camino, takes the name of Camino de Santiago (The Way of St James), but the truth is that there were, and still are, many Caminos de Santiago and the Council of Europe has recognized this by producing a European map of the routes that were taken to reach Santiago de Compostela. One of these caminos passes through the province of Soria in Northern Spain. The geographic position of Soria, half way between Galicia and Catalonia, played an important role in the cultural, religious, social and esoteric history of the pilgrims to Santiago de Compostela and it still continues being a stopover province for pilgrims. The Sorian connection with Santiago, or St James, begins with the legend of his preaching in Spain, since it is said that after visiting Galicia, he preached in the Roman settlements of Uxama and Numancia, before travelling on to Zaragoza, where the Virgin appeared before him. So we have here the very first Camino de Santiago, which passed through the lands of Soria on the ancient Roman route that connected Zaragoza with Astorga. After all, if we are talking about the ‘The Way of St James’, should we not be referring to the route St James himself took? A route that was for centuries one of the great branches used by pilgrims to arrive at Finisterre peninsular in Galicia. One through the ‘Pinares’ (Pine region), crossing the meadows of Mount Valonsadero, near Soria’s capital. This route passes through several villages including San Leonardo, Ucero and Osma. Another one went more directly from Soria to El Burgo de Osma, passing by Calatañazor. The third route crossed the province by Almazán, El Burgo de Osma and San Esteban de Gormaz, joining the road from Zaragoza to Valladolid. Other Caminos connected Soria with Aragón via Medinaceli, and Soria with Pamplona via Ágreda, but the provincial central axis of all these Camino’s was Osma, where they all converged. 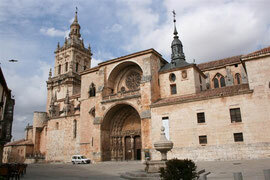 Soria, Northern Spain is where you’ll find the greatest amount of Santiago myths concentrated. These myths talk about Santiago appearing in battles and conflicts, usually on a white horse. One such myth described by Florentino Zamora (Leyendas de Soria) is based in Suellacabras. Here it is said Santiago being chased by a dragon, pushed on his horse and sought refuge in the Hermitage of San Caprasio. Apparently you could see the mark supposedly left by the horseshoe from when the horse struck the door of this holy place so Santiago could shelter inside. 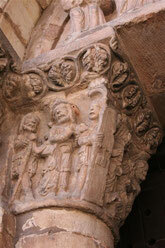 This Romanesque hermitage is now in ruins and any mark has been left to the elements. A similar legend exists in the Canyon Rio Lobos. Villagers from Ucero, recall that Santiago throw his sword into the Canyon and where it landed the Templar hermitage of San Bartolome was constructed, where you can clearly see carved on a ‘canecillo’ the monogram of Christ typical of the ones found on the French Camino. For a long while the Camino de Soria could not be used by pilgrims due to occupation by the Moors. Once the territories along the route had been cleared and repopulated around the end of the 12th century, the route was once again followed by pilgrims from the Spanish and French Mediterranean, as well as those coming from Italy and the East of Rhone. They would use this Camino as it is shorter than the French one and could be enjoyed during this time of guaranteed security. These routes were protected by Military Orders who also gave shelter to the pilgrims. 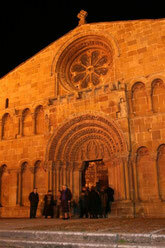 Two of these Orders were created in Soria, firstly Calatrava in 1158 AD and the Order of Santiago in 1173 AD. Soria also has several sites connected with the Knights Templars such as San Polo, San Juan de Duero and Agreda, where the Templars were first established in the province. 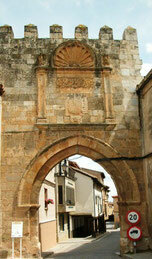 It is believed that Louis 7th and St Frances of Asis travelled along this camino via Soria to Finisterre. It is also possible that James 1st traveled this way to give thanks after taking the Balearic Islands. Whilst the Camino de Soria has been studied very little and does not share the popularity of its French counterpart it does have many interesting sites and religious relics to visit and appreciate. El Burgo de Osma, a major stopover on the camino is home to one of Spain’s most important cathedrals where you will find the relics of Saint Domingo de Guzmán (1170-1221) and Saint Pedro de Osma, whose intricate sarcophagus of polychrome stone is, dated 1251. There is also the 40 bed hospital of San Agustin whose mission was to hospitalise the sick and to give refuge to pilgrims and transient paupers. In the Plaza de los Peregrinos (Square of the Pilgrims) in the small rural village of Renieblas there are the remains of a possible hospital for pilgrims. A sandstone gateway is conserved and in its lateral stones there is a carving of the highly recognizable scallop shell and in the centre a small shield, perhaps of the religious order that ran it. The Parochial Church of Osma (near the site of Uxama), located next to a Roman bridge, houses the remains of Saint Christina de Somport. In the high altar you can see a glass case with her incorrupt body and a chalice with her blood. In Masegoso, another small village along the Roman road to Astorga the scallop shell is visible in the façade of the church as well as on the ornate door handle. Although the market town of Berlanga de Duero is a little further away from the Camino, there is the Church of Santa Maria del Mercadom, in whose chapel of San Andrés the arm of Saint Maria is kept, as well as the heads of the martyrs Vivencio, Justiniano, Versabea and Eufemia. In another chapel there are conserved relics of Saint Barbara (of the group of the fourteen saints from the Medieval period) and of Saint Pedro de Osma. The remains of these saints would justify the detour of the pilgrims from the camino as well as the presence of the Hospital of San Antonio. Across the road from the hospital the only remaining gate along the town walls contains the scallop shell, welcoming pilgrims. 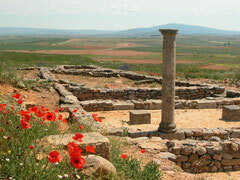 The remains of the Roman settlement of Uxama and the Celt Iberian/Roman settlement of Numancia can be visited. 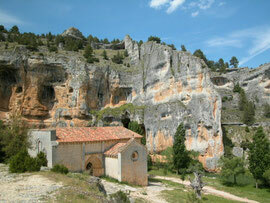 St James is said to have preached in both of these places on his way to Zaragoza. There are those that doubt Santiago ever preached in Spain. Yet others believe he did indeed make it to “Finis Terrae”, (the edge of the world) and fulfilled the mandate of Christ “go everywhere and proclaim the Good News to all creation”. Whichever version of history you believe there is no doubting that the Camino de Soria was a route of exceptional importance to pilgrims and still welcomes travellers today.